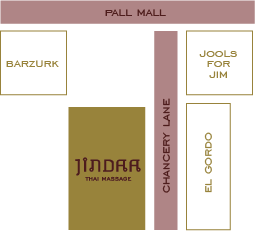 Jindaa Thai Massage offers the best of both worlds with traditional Thai massage therapies and Western style sports and relaxation style massages. Our authentic experience guarantees the best treatment for your individual need. Thai Massage (Nuad Thai) is an authentic healing art and unique form of body therapy developed by people who used massage not only as a therapeutic method of healing to treat illnesses, but to maintain health and well-being. Herbal Body Compress Ball (Herbal Ball) has been used as an ancient healing system for massage chronic problems such as back pain for many centuries in Thailand. It commonly complements traditional massage. A sports massage is a type of therapy and also cooperated deep tissue massage geared toward active individuals, usually those who present with common strains resulting from strenuous exercises and movements. Ancient healing practice based on the principle that there are reflex points on the feet that correspond to the body’s different organs and glands.